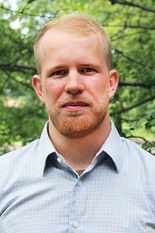 Aerospace Engineering graduate student Jonathan Chambers was awarded a scholarship from the Society of Tribologists and Lubrication Engineers (STLE), Philadelphia Chapter. The scholarship recognizes students who have demonstrated exceptional academic success and accomplishments. Chambers is a third year graduate student studying under the mentorship of Department Chair, Minta Martin Professor of Aerospace Engineering Norman Wereley. His research is in the application of pneumatic artificial muscles (PAMs) and the characterization of magnetorheological (MR) fluids. PAMs are devices that extend or contract by filling a pneumatic bladder with pressurized air and are used in applications such as trailing edge flaps in rotorcraft and robotics. MR fluids are smart fluids that can change viscosity when subjected to a magnetic field. Chamber's research aimed at characterizing the sedimentation of MR fluid and he developed a device to test the sedimentation. Through the STLE scholarship, Chambers hope to expand his academic experiences through greater involvement in engineering activities and volunteer opportunities in the Washington D.C. engineering community. Chambers was a member of the 2014 American Helicopter Society Student Design Competition, and he credits this experience with both building relationships within the department and expanding his involvement in activities beyond of the department. In the future, Chambers would like to do research in the field of human assistive devices. In particular, applications that could aid people with physical disabilities and help people perform tasks that are otherwise physically strenuous or impossible. STLE aims to advance the science of tribology and the practice of lubrication engineering in order to foster innovation, improve the performance of equipment and products, conserve resources and protect the environment.